As a financial genius, global philanthropist, political activist, man of conscience, and the world’s only investor with his own foreign policy–it cannot be denied that Soros is an enigmatic man of enormous influence. For more than four decades he has been so successful that he has been accused of directing the course of global markets and shaping the destinies of nations. He’s been hailed as the “World’s Greatest Investor” and “King of the Hedge Funds.” In the 1980s he worked tirelessly and spent lavishly to help bring down communism in Eastern Europe and establish open societies where none existed. Yet he now asserts that his life’s mission is to defend democracy against capitalism and “excessive individualism”. An avowed liberal, he’s vilified on the right and admired by many on the left. 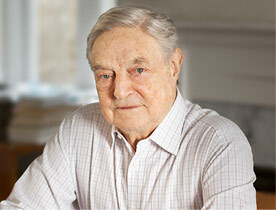 George Soros has been making headlines for more than four decades, yet he remains as much an enigma as ever–especially to those who would divine the secrets behind his phenomenal success as a global investor. Now, in this thoroughly updated, substantially expanded edition of his 1996 bestseller Soros, biographer Robert Slater goes beyond the headlines and the oft-told tales to reveal the man behind the legend. Working from extensive interviews with Soros himself, as well as Soros’s business associates and friends, Slater traces his subject’s life across two continents and more than seven decades. We see Soros as a Hungarian boy whose favorite game was Monopoly; a Jewish teenager on the run from the Gestapo; an émigré in England who waited tables and served as a lifeguard tp survive; a burgeoning intellectual at the London School of Economics with a flair for analytical philosophy; and as a new arrival to his adoptive homeland, the USA. Slater also closely tracks Soros’s meteoric rise from unsuccessful gold arbitrageur to “The Man Who Moves Markets.” He chronicles many of Soros’s financial triumphs and missteps, digging deep to provide new insights into some of his most sensational coups, including Soros’s history-making move against the Pound-a play that netted him a cool $1 billion and seemingly threatened to break The Bank of England. And in entirely new chapters devoted to Soros’s political awakening, Slater describes his growing involvement with national politics during the 1990s, his role in helping to launch the liberal political action group, Americans Coming Together, his mounting obsession with George W. Bush following 9/11 and his efforts to unseat him in the 2004 election, and his widely misunderstood involvement with Moveon.org.